My Gorgeous Girlfriend and I moved into our current house at the end of July 2006. Before that I'd had a small, South-East facing patio that I grew tomatoes on in pots, with a tiny strip of bare earth the other side of a low fence. Our new house has a front garden on a bit of a slope, and a flat back garden. Both were pretty much totally grass, with some weeds and a couple of old shrubs. 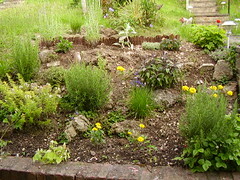 This is half of the front garden. The garden extends to the right of the set of steps probably half as much again as this side, but otherwise looked pretty similar. There were no fences to separate any of the gardens, and mowing the slopes is a nightmare! The back garden wasn't a lot better. The large shrub pictured at the bottom left blocked the late evening sunshine to the room and the view, and was really a bit knackered. 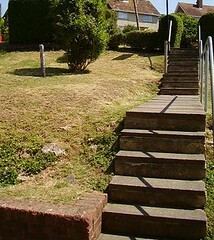 The steps originally followed the washing line, which was tied to a large metal pole in the far corner. The concrete kind of dominates, but was nice to sit on in the sun. The fences were a really strong feature too, but not high enough to give any kind of privacy. I'd brought a few of my plants with me in pots, particularly the herbs. 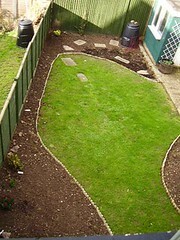 So the first bit I did was clear the slope right outside the kitchen door and plant them up. There's still some experimentation going on between the various plants, but the framework is developing nicely. I've had a few on-going battles with slugs and snails. Oatmeal seems to be the key. 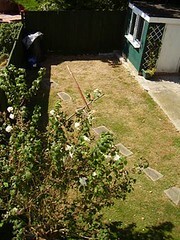 Next was the back garden. 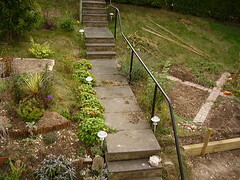 We dug some beds out of the grass and edged them, and reused the stepping stones to give access to the scooter bed. We found some interesting stuff as we did it! The large shrub close to the house has gone now, but a variety of shrubs and trees have been planted that given time will provide us with privacy and something to look at! This year has been a case of trial and error, and next year will be better, but it's still be a big improvement on the blank patch of grass. The concrete is still quite a big feature of the garden, but I have plans to soften it in the future. Out front again we put in a vegetable plot on the large flat area. More digging! The neighbours think we're gluttons for punishment by this point. The soil is a bit ropey (well, chalky), and there is lots of scope to improve it. 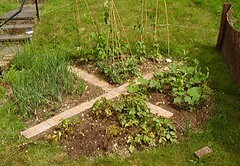 But we got a good crop of potatoes, onions, runner beans, squashes and some peas in the first year. Throughout the garden I'm trying to use some permaculture principles in both the design and maintenance, so there will be ongoing posts on how the different sections go. Starting in January 2009 I'm taking pictures on as close to the first of the month as I can get, and posting each of these with a bit of a review of what I'm pleased and less pleased with.